Escape from Obesity: Finally, a Truly Low Carb Calzone Recipe! Finally, a Truly Low Carb Calzone Recipe! Over the years I've looked and looked online for a decent low carb substitute for calzone dough. You can make it with almond flour; you can use CarbQuick and other commercial mixes. You can even make the crust with flax seed meal. But all of those things are too carby for my current plan. I also don't want to make something that is *so similar* to real pizza dough that it sets off cravings or makes it difficult for me to stop at one serving. 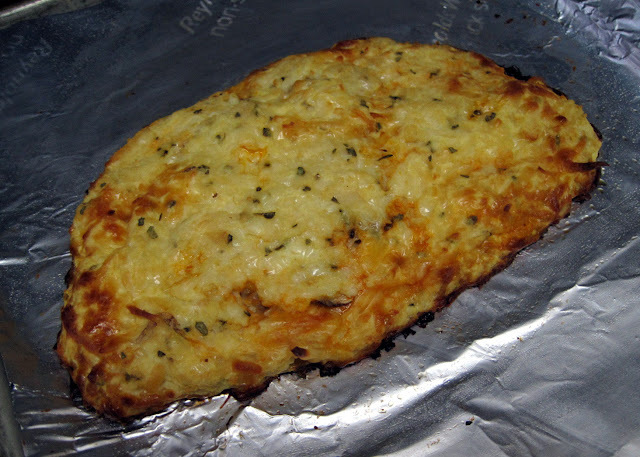 I've already made and enjoyed low carb cauliflower crust pizza, so I thought, hey... why not? 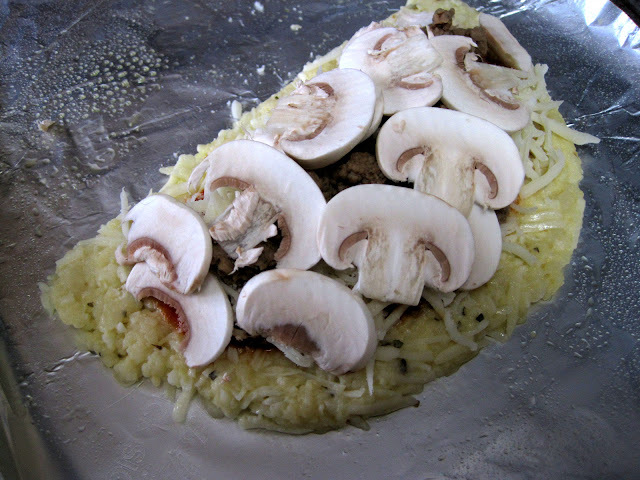 I'll try making a calzone from the cauliflower crust recipe. The remaining "dough" was still in a mixing bowl; I left it in the bowl and pressed it into a thin, similar shape. Then I slid it from the bowl onto the calzone. I used my fingers to push the edges together and seal in the filling. I put it in an oven preheated to 350 degrees and baked it for about 20-25 minutes, until golden and firm. I let it cool slightly and then cut it in half to eat with a salad for a complete Lean & Green meal on Medifast. And yes, you can pick it up to eat it! Great stuff, and a wonderful way to eat more veggies! This one's a keeper for life. Next time, I plan to add more mushrooms, sauce, and green peppers. You could also use low fat ricotta in place of the mozzarella in the filling. Enjoy your *healthier* calzones! I can not wait to try this!!! I am Italian and doing mf so you know this recipe is a HIT!!!! Thanks Lyn!!!! I appreciate that you are trying to make healthy meals but you said something interesting - that you didn't want to make it TOO like a calzone so it wouldn't trigger you. So I ask why bother in the first place? I don't eat breads, etc (follow a pretty paleo diet) and most every night just make a protein with a big old side of veggies... I never try to make my food resemble other foods i used to eat. I gave up pizza and calzones and all that stuff and I find it helpful for my brain to just eat food as nature intended. Just throwing it out there! woo-hoo Lyn...I am going to be making this over the weekend! thanks for figuring that all out for me...errr...uh...I mean US! Your faithful followers!! Mmmmmmm, sounds and looks delicious! Lyn, you rock! This looks so good! I'm on Medifast (thanks to you! 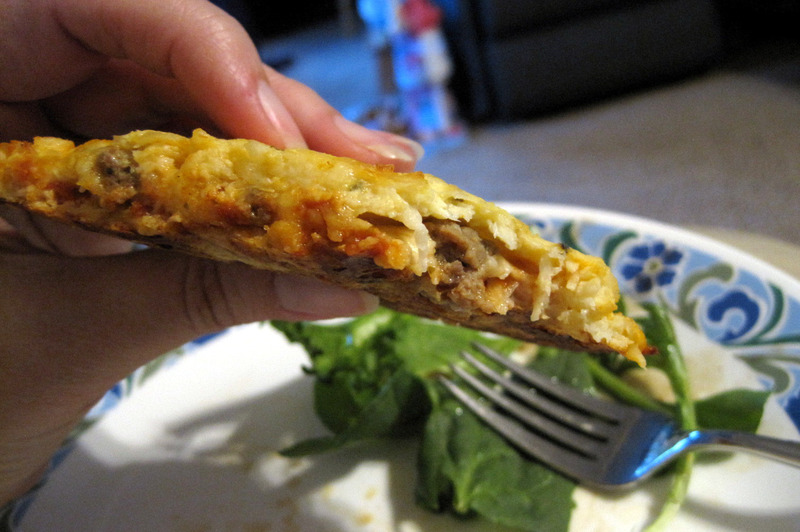 ), and have enjoyed the cauliflower breadsticks and pizza on occasion, they help make the diet easier to stick with! Now I have a new option! YUM!! My husband and I have enjoyed the pizza 'dough' many times. We'll have to try this one now. Wow, that looks amazing!! I'll have to try that for me and my SIL next week for lunch. I've made the cauliflower "dough" before, but it didn't set up, so it was a knife and fork pizza, but still good! I've found that getting as much moisture as possible out of the cauliflower helps it be more firm. 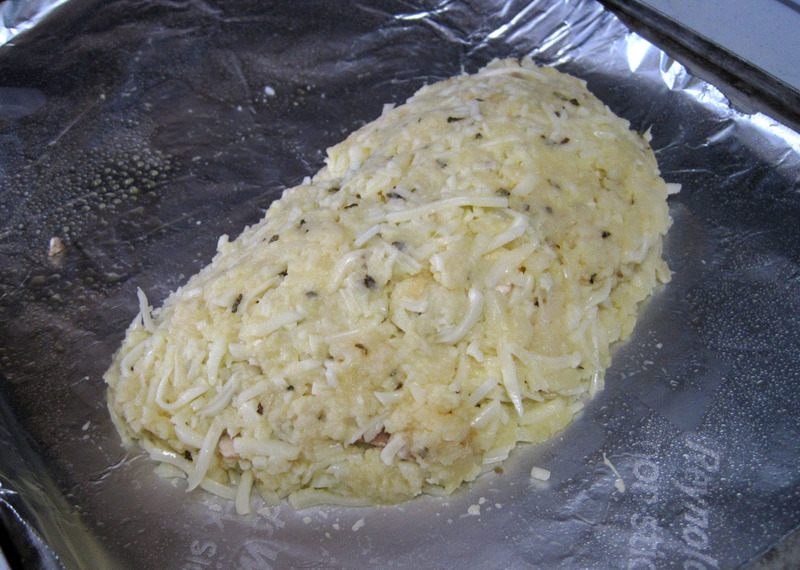 And adding part of the topping/filling cheese to the "dough" also helps firm it up! Hope you enjoy it! Looks great. How many carbs do you estimate are in that total. Is that one or two servings? this recipe is one serving and has 15 grams of carbs (excluding the mushrooms, or any additional toppings you add). Like someone else commented, usually we just eat a chunk of meat (venison) or chicken, with a couple of non starchy veggies on the side. BUT sometimes, you just want something DIFFERENT! Making this tonight, with salad.